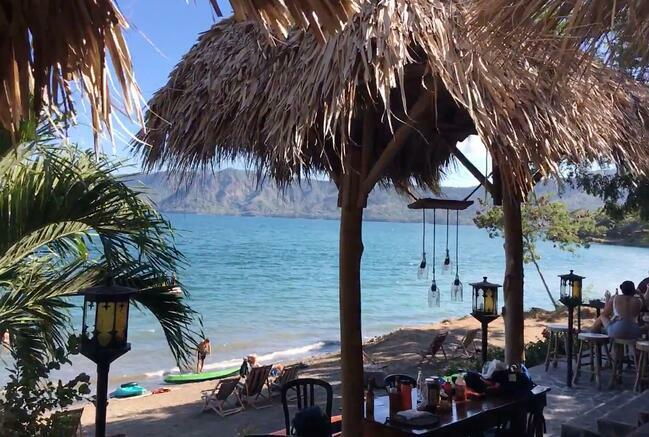 We're in love with the hidden gems here and that includes this beautiful lake in Nicaragua. Here's what you need to know as you plan your visit for the best getaway ever! 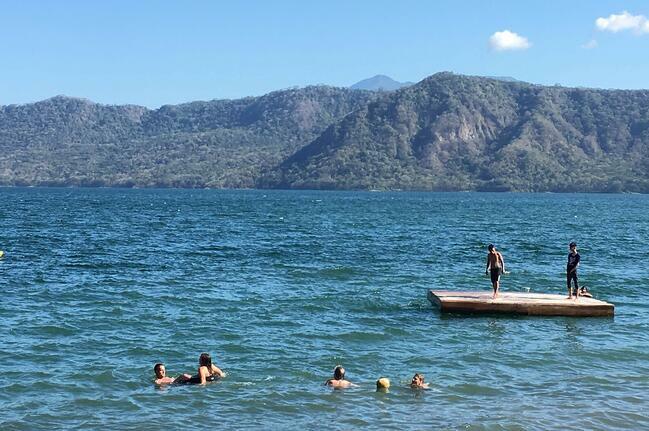 Apoyo Lagoon is a perfect little swimming place, and it's actually formed by a volcano — how cool is that?! Visiting is super easy when you are living and volunteering in Granada for a semester. So, plan your trip with us and get over there ASAP! 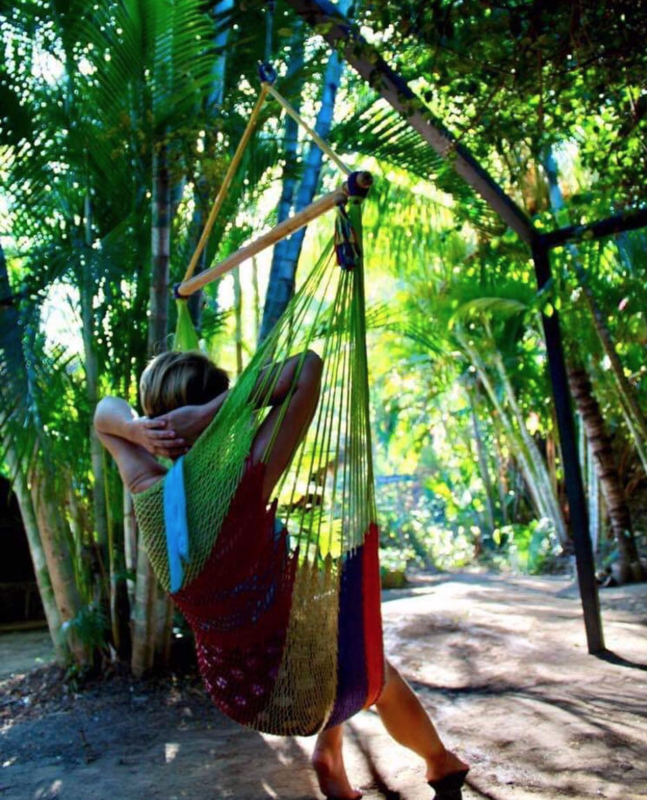 Want to learn more about volunteering in Nicaragua? Check out our guide which will fill you in on all the details! You can find public access points to the lagoon (it's a little tricky) or, for a small fee you can enter the lagoon from the resorts and their entrances which we think is the way to go. The resorts will have different amenities you can use, making the day even more fun. There are a few resorts in the area, but we recommend these! The Laguna Beach Club has a $6 entrance fee and offers a ton of amenities. You can rent paddle boards and kayaks, play ping pong and bocci ball, hangout on the floating dock, use the free WiFi, and relax in the hammocks. They also have a restaurant (not included in the entrance fee price) so you can grab food if you'd like. This hotel is nestled in the dense forests right on the coast of this crater lake. 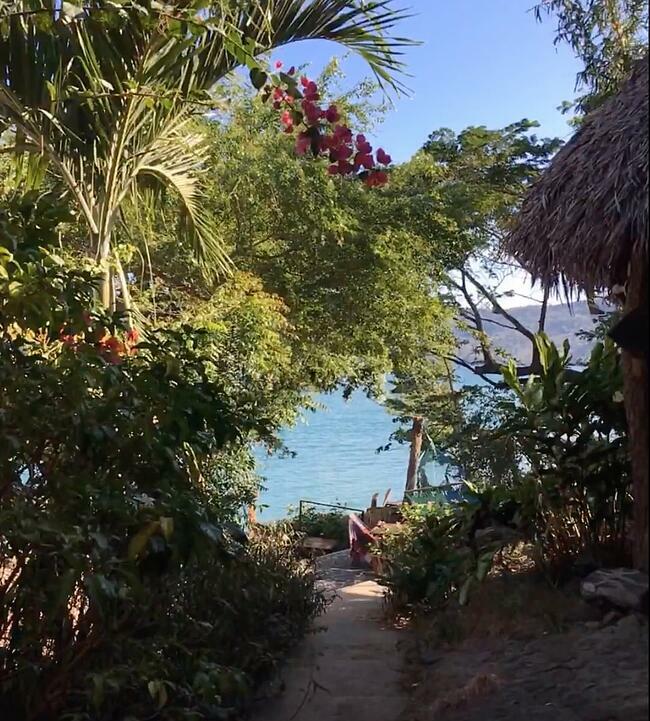 Similar to the Laguna Beach Club, it's a similar priced entrance fee and you'll find hammocks slung up in the trees, kayaks and paddle boards to rent, plus it has awesome smoothies you can buy after a day of swimming and lounging. First and foremost, spend some time relaxing on the warm sand. We also love the hammocks you'll find at most resorts. The vibe is chill here to the max and we're all for it. If you want to do more than just laying by the water, no fear because there's plenty of options. Rent some kayaks and go exploring the lake. Or, test your balance by renting a paddle board. There are even floating docks out in the lake where you can swim to (or kayak too). Lay out on the warm wood to soak up some rays, or jump off the platforms. The area is SO green so bring some sturdy shoes and head out for a hike. You can get some killer views of the lake if you head up into the surround hills. Because it's so close to Granada (where you're living as an ILP volunteer in Nicaragua), a quick Saturday trip is perfect. Plan on an hour round trip for travel and the rest of the day can be spent relaxing. It is the cheapest and easiest weekend get away you'll ever have! Bring a swimsuit and beach shoes. You'll also want lots of sunscreen and water for the day out in the sun. Also pack up a change of clothes (if you got a resort pass, you can use their restroom or changing rooms so you're not riding home in a wet swimming suit). You will also want snacks — there are restaurants right off the beach, but they are a little pricey. You can also get snacks from the walking vendors selling things like fried yucca and fried plantains, or you can just bring your own snacks. Bring your camera if you want! There are lockers that you can lock stuff up in if you hang out at Hotel Paradiso. There are a couple ways to get there. Lucky for you, they are all super affordable, even the most luxurious options. You can actually ride a shuttle from several different hotels in Granada and they will take you right to the beach clubs. We had an ILP group use this option and they highly recommended it. Here are the details to catch a shuttle, but past groups paid $14 which included transportation there, and your entrance fee into the Laguna Beach Club. The bus picked you up at 10:00 AM, and took you back at 4:00 PM. Or, you can DIY. 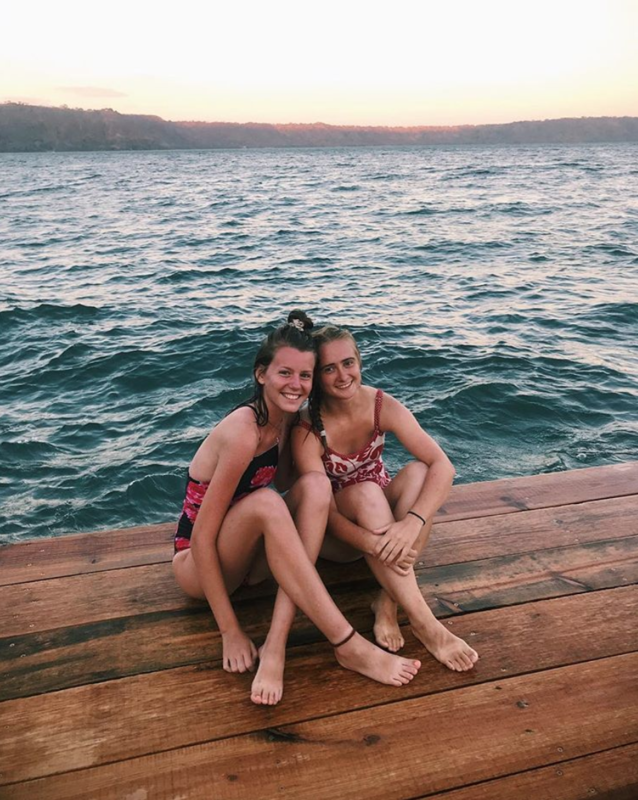 Head to the market and find the bus that goes to Managua, let them know you want to be dropped off at la Entrada de la Laguna and you can hop off at the entrance to the lagoon. It should only take about 30 minutes and costs about 20-30C ($0.60- $1 USD). Buses leave about every 15-20 minutes so catching one should be easy. A taxi is also affordable and a lot of them will do a flat rate of around 200C (about $6 USD). Just make sure you agree on an amount before you hop in an go. A taxi will take about 20 minutes to get to the lake. 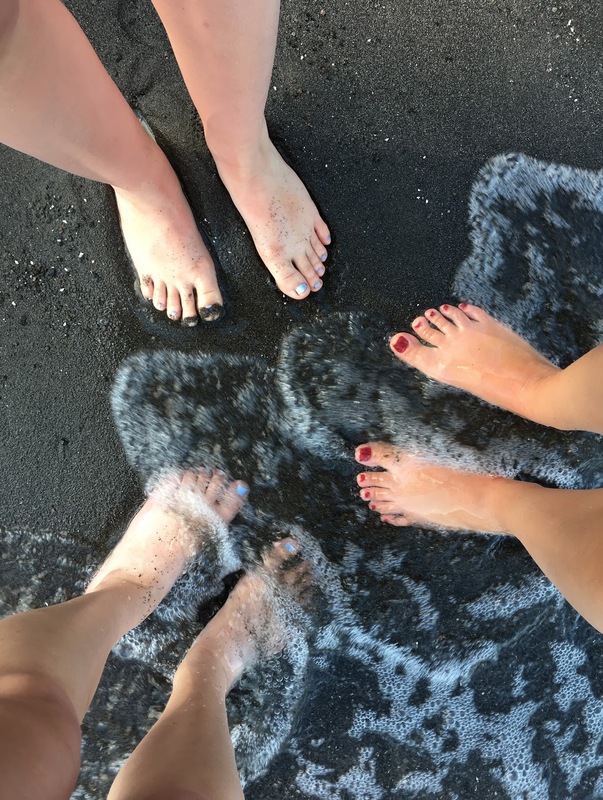 Ready for a semester abroad in Nicaragua? You'll be teaching and changing the lives of the cutest kids around, traveling, and getting to know the culture of this beautiful country for a whole semester! Click the button below to apply now!